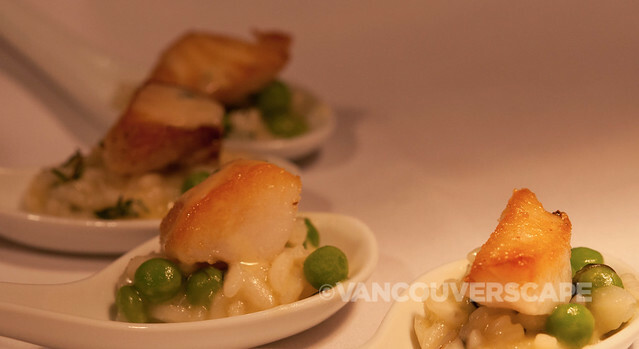 Last night, I was invited to Dishcrawl Vancouver’s latest dining adventure, this time in Yaletown. Our group of 25 food lovers were escorted through the heart of the neighbourhood, stopping at four establishments over the course of the evening. Dishcrawl started in the Bay Area, leading foodies through parts of the city to discover offbeat and unique dishes. The movement has blossomed north to include Montreal, Toronto, Ottawa, and Vancouver. 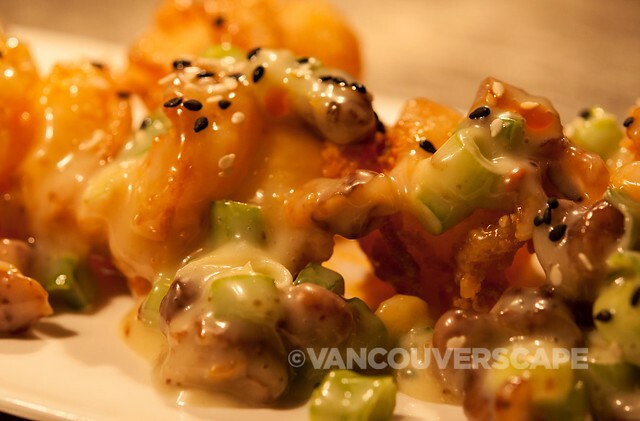 For $60 a person, Vancouverites are led by a Dishcrawl ambassador from one spot to the next. 48 hours prior to the event, you’re contacted by email for the start time and location. 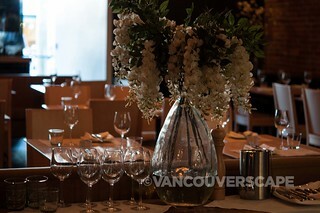 The organization notes any food allergies or dietary restrictions for the restaurants ahead of the event. 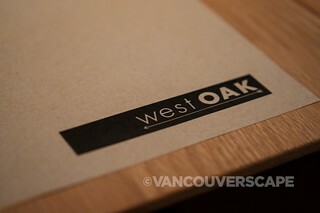 We started at West Oak, (formerly Chinois), a restaurant priding itself on locally sourced suppliers. This relatively new space on Mainland Street features modern accents with kitschy paintings in the back lounge. Our meal there consisted of four samplings: Chinois jumbo prawns, triple-cooked house fries (steamed, blanched, then cooked to order in high-temperature oil), seared sablefish with arborio rice, and fresh-baked cookies with a vanilla bean creamy dipping sauce (indulgent!). 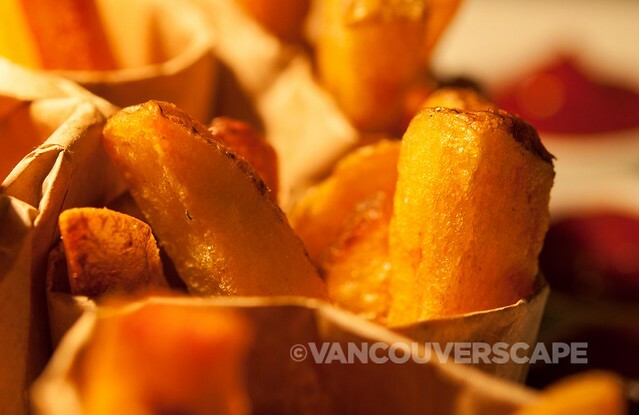 Those fries are decadent – crispy on the outside, tender on the inside, and are a perfect pairing to West Oak’s Vancouver Island mussels, AAA burger, grain-fed free-range chicken or grass-fed cattle steaks. West Oak is located at 1035 Mainland Street. 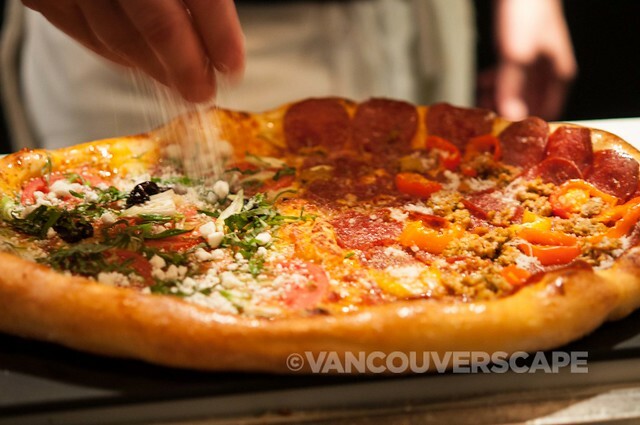 Our second stop was at The Parlour, home to hand-crafted pizzas, sandwiches, and shared plates. We started with the Brocco, a plate of garlic and jalapeño-infused broccoli in a sweet soy sauce. I’ve enjoyed this on their menu in the past and it’s always a treat, with the broccoli perfectly cooked and not overdone. 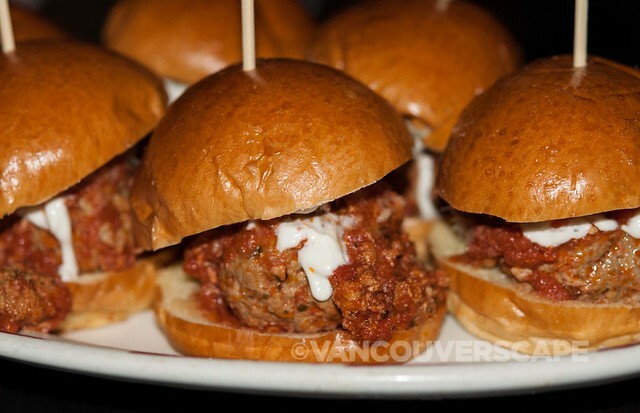 A platter of meatball sliders arrived next, simmering in a tomato sauce with roasted garlic aioli on a brioche bun. While not an aioli fan, I did enjoy the slider for its tomato sauce/beef combination. The reggiano was unfortunately blasted out by aioli. 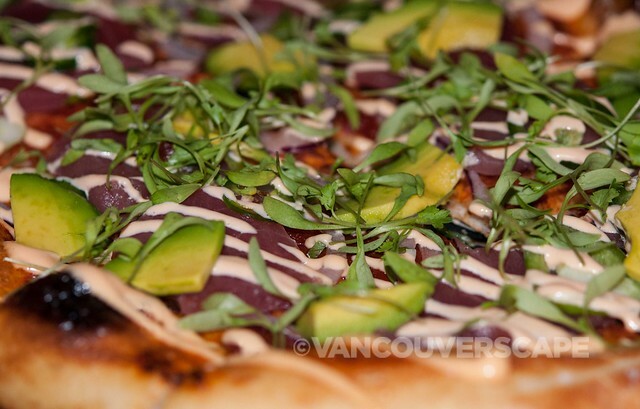 Parlour chose to share their Yaletown pizza with our group, a creation of Ahi tuna, red and green onion, avocado, Jalapeño, cilantro, and spicy aioli. Again, the aioli nearly kills the joy for me every time, but I did get a bite of the tuna, avocado, and cilantro together. Without the aioli, I might very well return to try this one, although there are several other pizzas (including the Wake n Bake with tomato, proscuitto, easy egg, basil, mozza) that look appetizing from their menu of a dozen pizzas. 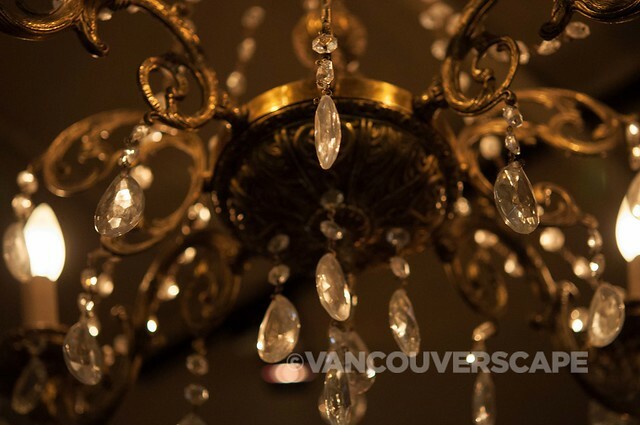 Parlour Yaletown is located at 1011 Hamilton Street. We then ventured to Urban Thai Bistro, where we were each served a taster plate with chicken saté skewer, peanut sauce, spring roll, and noodle-wrapped shrimp. The shrimp was artfully presented but could have used a sauce for dipping as it was on the dry side. The satés are always done right with the rich but not overwhelming peanut sauce. The restaurant’s service is always fast and friendly, which is why my husband and I have been coming here for years. 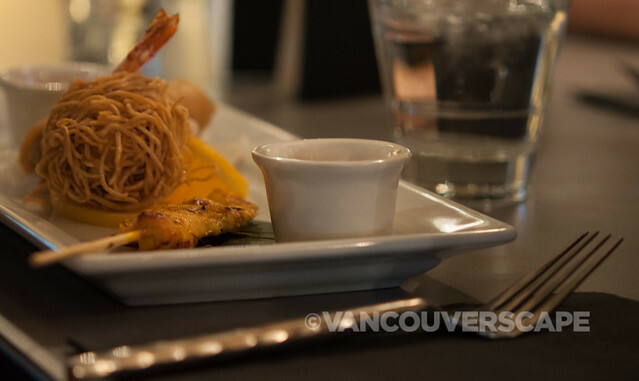 Urban Thai Bistro is located at 1119 Hamilton Street. 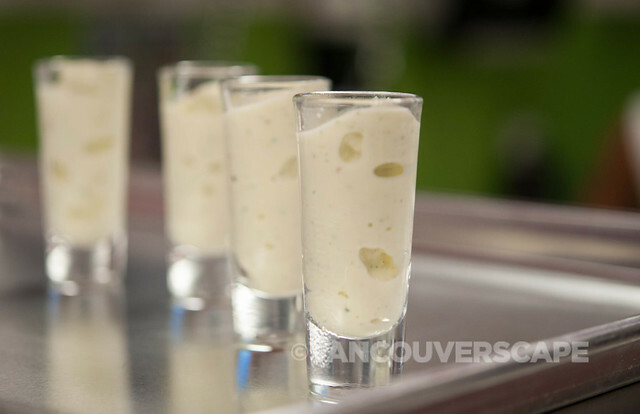 Our fourth stop was to Canada’s first gourmet milkshake bar, recently-opened What’s Shaken. Owner Xiomara Lopez opened the shop in late March. 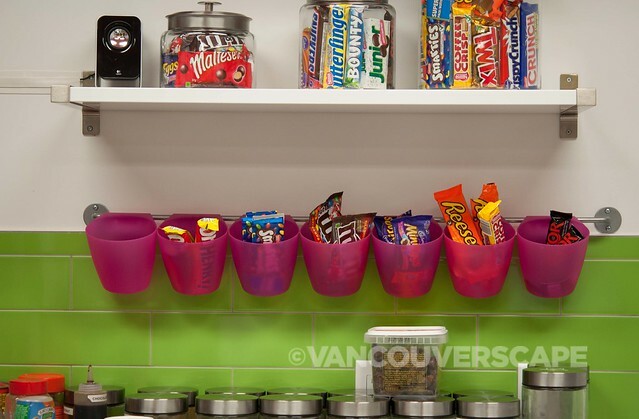 The concept behind What’s Shaken is a modern take on the milkshake parlors of the 50’s, complete with premium locally-sourced ice cream, a wealth of fresh fruit, veggie, cereal, and candy toppings, creating an endless combination of possibilities. We tried three shakes: the Cool as a Cucumber (vanilla ice cream, pears, cucumber, lemon juice), the Creamy Caramel Swirl (vanilla ice cream, milk, dates, caramel, cinnamon) and a simpler kiwi-strawberry combo that’s not on the menu. My favourite was the Creamy Caramel Swirl, with its mild sweet flavour and dusting of cinnamon on the glass. Lactose-intolerant milkshake fans will get their fix here too as various non-dairy products can be swapped out for milk. 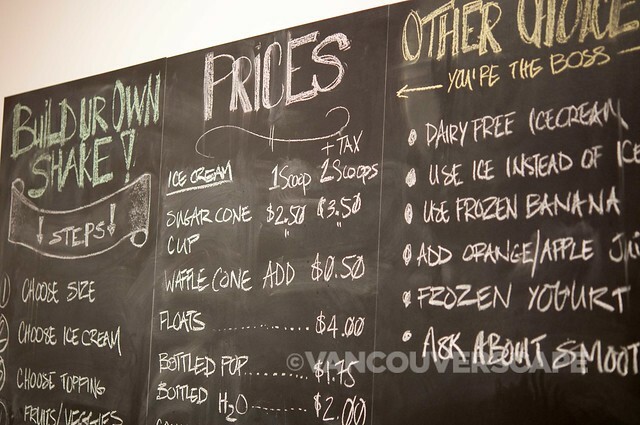 Their Coconut Bliss ice cream is soy-free, dairy-free, and vegan. My only complaint was not with their creamy, delicious shake samples, but that it was a skimpy end to the evening. Instead of tiny sample glasses, it would have been great to have ordered from their extensive menu of custom ingredients. 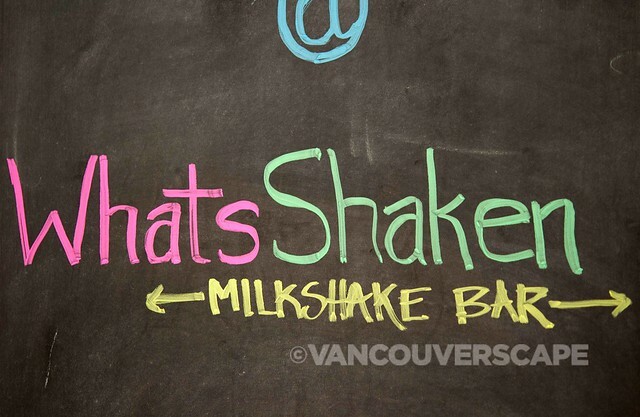 What’s Shaken is located at 586 Davie Street. Many thanks to Jennifer and her team aka our friendly Dishcrawl ambassadors, who kept track of us all as well as on our remaining time for each stop! 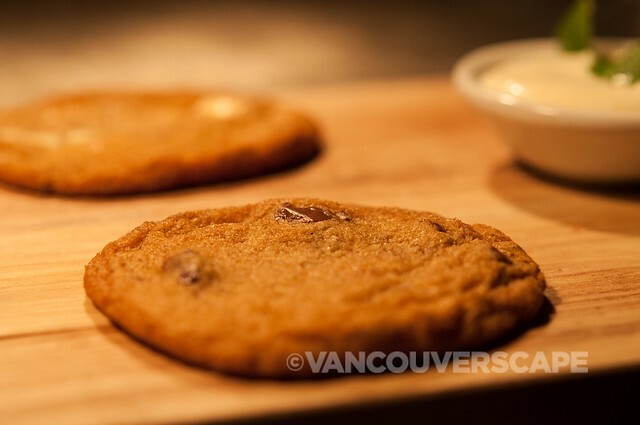 Disclaimer: I was invited to Dishcrawl Vancouver for the purpose of writing this article. I’ve previously attended Dishcrawl: Silk Road edition.